Started by Kristi at The Story Siren, who was inspired by Alea at Pop Culture Junkie. Darkness falls so quickly in Howland that the people there have no word for evening. One minute the sky is light, the next minute it is black. But darkness comes in other forms, too, and for thirteen-year-old Annie, the misery she endures in her Uncle’s household makes the black of night seem almost soothing. When Annie escapes, her route takes her first to a dangerous mine where a precious stone is being stolen by an enemy of the king, and later to the king’s own halls, where a figure from Annie’s past makes a startling appearance. All the while, reported sightings of kinderstalk— mysterious, wolf-like creatures that prowl Howland’s dark forests—grow more frequent. 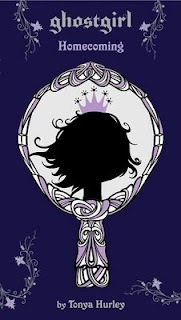 Eloquent, suspenseful, and imbued with fairy-tale motifs found in The Brothers Grimm, this is a riveting coming-of-age story of a girl who must learn to trust her instincts if she’s to lead the people she is destined to rule. I got this book for review and it sounds really good. After spending an entire summer planning how to get Damen, her crush, to notice her, Charlotte Usher's life seems to be looking up when Damen is made her lab partner. However, only moments later, her plans come to an end when she chokes to death on a gummi bear. Charlotte becomes a ghost, invisible to everyone she once knew, and forced to go to "Dead Ed" - a school for dead teenagers - to learn to use her supernatural abilities. 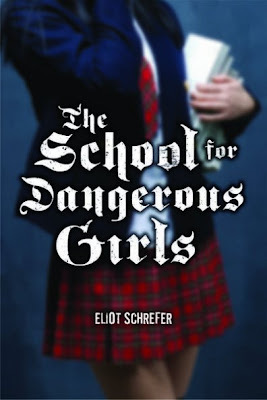 While spying on Damen with his girlfriend Petula - the cheerleader Charlotte idolises - Charlotte discovers that Scarlet, Petula's goth sister, can see her. She convinces Petula to allow Charlotte to possess her so that she can spend time with Damen, much to the disapproval of the other ghosts at "ghost school", who are trying to find a way to save their home, Hawthorne Manor from destruction. However, matters are complicated when Scarlet begins to fall in love with Damen, and no longer wants Charlotte involved with him. It sounds really different, but really good. Charlotte Usher discovers that the afterlife isn't quite what she pictured when she's forced to intern at a hotline for troubled teens. Before she can officially cross over, she'll have to be a source of guidance for one such teen. The problem is she doesn't have much advice to offer since dying hasn't exactly boosted her confidence level. But when Hawthorne High's leading, love-to-hate cheerleader Petula and her gothic little sis' Scarlet find themselves suddenly resting-in-peace in comas, Charlotte's opportunity to save them will prove to be the risk of a lifetime-for all of them. I got this for review. It sounds really good. This is the final book in the series. I suggest reading the first two, before this review. Since it may have spoilers in the previous books. Cathy wakes up to three bodies outside of her window. She thinks that maybe it was Victor, who killed them. He says that he didn't Emma is also getting stalked, so now she is staying at Pete's. Ancestor Lu made Victor poor. Denny is broken from the fight with Tsao. Oh, her dad faked his death and is an immortal. So, Cathy decides to run off with Denny to Texas. When it really turns out that Denny tricks her and takes her to her friends. Cathy must now face it all. Luckily, she finds a very surprising Ally and they might just be able to defeat Ancestor Lu. Cathy was pretty cool in this book. She didn't complain as much and learned to defend herself. Victor complained about his money a bit too much and it drove me crazy, The plot was full of action and had some humor. It is really original. I love the layout of the the book; it makes it a bit more fun to read. Not fangirling... It is for a contest. So, I was watching the 15 second preview on Carol's blog. I am thinking that the first shot was of first beach. Um, I have been there about 10+ times, since I have family up there, and it looked nothing like first beach or even Second Beach. (Such original names.) Fist off Washington Ocean water is grey and if your lucky a greyish green. It isn't close to blue. Edward: Oh Sh*t. Um you can slow down now. You have that whole tripping thing. Edward: Um, are you okay? Bella: That is for not catch me. Edward: There was kind of sun over there. I kind of sparkle there. I kind of loves these things. So contest time with this. You can pick either picture and make caption conversation like this(Please say picture 1 or 2. So I am not confused.). Or you can use a different picture(book related) and caption it and send it to me at Sarahbear119(at)hotmail.com and label it contest. The winner gets an arc of The Sliver Phoenix by Cindy Pon, which I need to review, but I loved it. Anyways Good luck. You have till June 28th. Six month ago, Cathy found out her boyfriend, Victor is an immortal. Now he has to work for Ancestor Lu, or Cathy will be killed. Her boyfriend'sfather Tsao is stalking her and keeps threatening her. That if she doesn't marry him, something will happen. Also, a few days ago, Jewel stole her idenity. Jewel is also hanging around Tsao, and that might cause her to die. Jewel's Brother Denny, is looking for his sister. All Cathy knows is that she needs to fix everything quickly. Cathy is a very original character. Sometimes, she annoys me with her whining at times. About how everything , is affter her. Victor is also annoying at times, but most of the time, he is cool. I like Jewel and Denny. They were realistic and funny. The plot was pretty good. It wasn't predictable by any means. It was a very original book. I love the drawings and the packet of items relating to the story. It was a really cool effect to have as a reader, the writing could have been better, but I liked it. It was very fun and witty to read. This is a great book for those that don't read much. In an explosion of his own making, Lucius blew his arms off. Now he has hooks. He chose hooks because they were cheaper. He chose hooks because he wouldn't outgrow them so quickly. He chose hooks so that everyone would know he was different, so he would scare even himself. Then he meets Aurora. The hooks don't scare her. They don't keep her away. In fact, they don't make any difference at all to her. But to Lucius, they mean everything. They remind him of the beast he is inside. Perhaps Aurora is his Beauty, destined to set his soul free from its suffering. Or maybe she's just a girl who needs love just like he does. It just sounds amazing. I love the cover. I am just excited to read it. I suggest reading the first book Airhead, before reading this review. It may contains spoilers, so be warned. Emerson Watts is still stuck in Nikki Howard's body. Her true love, Christoper still thinks she is dead and is mourning over her. She still has Bradon Stark and Gabriel Luna wanting her. Now, Nikki's mother is missing. So, Nikki's brother, Steven hascome for answers of where she could be. Em also uncovers that Christopher wants to brink down Stark enterpries as revenge for her death. So how is Em suppose to balance all this with school, modeling, and the fact that Stark enterpries is turning evil. Will Em be able to handle this without losing some of her values. This book is awesome. Honestly, you never know what trouble that Em will be getting in too. Cabot creates anothor fantastic world to get lost in. The writing is marvolus and fun. I reccomend it to anyone looking for a fun read. I can't wait to read the next volume in the series, Runaway. Everything Beautiful in the World by Lisa Levechuk. Edna's mother has cancer, and most people are willing to let her get away with anything. For example, she can fail a Latin test, be late to class, and skip tennis practice. There is one thing that Edna is fairly certain that she can't get away with... dating her teacher. Yet, Mr. Howland is so perfect or well she thinks so. He has long tousled blond hair, great skills on the guitar, and can do a great impression of Dracula. Edna is happy for the first time in a while. Every time, she kissed him, she feels like she is floating. Suddenly more people know and it gets complicated. Edna doesn't know if it can last much longer. Edna was a wonderful character. She did somethings that she later regrets, but what teen hasn't that happened too. She was very caring. Like wondering what happened to her brother, Tommy and also with her mom. I felt bad that she thought it was her fault. Mr. Howland was a selfish man and a jerk. I don't understand what Edna saw in him. Also, why didn't Barbie and Patty tell on him? It really annoyed me. The plot was pretty good. It wasn't predictable. The writing was fantastic and I can't wait for more from Levechuk. I love this book so far. The cover is so pretty. In the wake of her father’s death, Ash is left alone to pay off his debts in the service of her own step mother. Consumed with grief, her only joy comes by the light of the dying hearth fire, re-reading the fairy tales her mother once told her. In her dreams, someday the fairies will steal her away, as they are said to do. When she meets the dark and dangerous fairy Sidhean, she begins to believe that her wish may be granted. 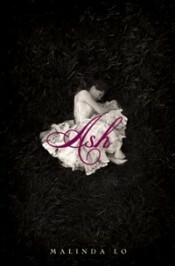 Entrancing and romantic, Ash is an empowering retelling of Cinderella about the connection between life and love, and solitude and death, where transformation can come from even the deepest grief. I love the cover and it sounds really good. This book sounds amazing. So excited to read it. Alexis thought she had a typical dysfunctional high school exsistence: dysfunctional famil, he crazy doll obsessed sister Kasey, and an antisocial attitude. When a family arguement results in a tearful sisterly bonding experience. Alexis realizes the her life is no longer dysfunctional. It is scary and dangerous. Kasey is acting like a her normal self, until her blue eyes are changing to bright green.. She is using language that is decades old. She is also blacking out time chunks of time. There old house is acting odd too. Doors are opening and Closing on their own, Water is boiling on a unlit stove, and a unplugged air conditioner is making it freezing. Alexis wants to think that it is all in her head and that there is no connection between her sister and the house. Also that both are harmless. Until she finds a list of names, a plot, and the history of the house. Soon, she gets help from two unlikely sources. I loved the characters. Alexis was funny, fresh, and not the normal anti-social. I found Kasey and Sarah to be great villians. Carter and Megan were awesome too. I didn't expect Megan to help Alexis. Carter was a sweet guy. The plot is great. It was scary and full of action. This book was really original. The creepy doll obsession was a nice touch. I have always hated collecter like dolls. I love the parts that Alexis was doing Photography, because I have always wanted to do it. Alender's writing was fresh and exciting. I liked the descriptions of what happened. 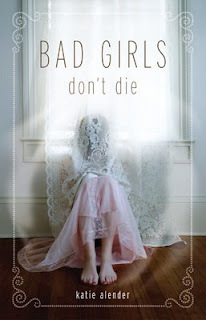 I recommend Bad Girls Don't Die to anyone that likes anything scary , creepy, or paranormal. It is the perfect book for that. is broken again. I will try to blog everyday but that might be really hard. I am at the library at the moment. 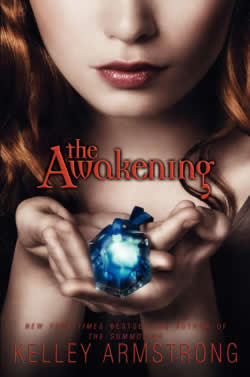 The Awakening is the second book in Armstrong’s Darkest Powers series. I am giving you a quick spoiler warning. Chloe Saunders used to think that she was a normal teenage girl. Recently, she found out that she is a walking science experiment. She is a necromancer, and can see ghost and raise the dead. She was sent The Edison Group to get better, when they were the people that started it all. She is now on the run with three of my supernatural friends – a charming sorcerer Simon, a cynical werewolf Derek, and a disgruntled witch Tori. We have to find someone who can help us gain our freedom back before The Edison Group finds us first. Or die trying. The Awakening was just as good as The Summoning, if not it might be even better. The characters were more developed and more interesting, in the book. The plot was amazing. I liked the parts of them being on the run. It was pretty original. The writing was well done. I can wait for more from her. I think that I will have to check out a few of her adult books. I recommend checking out this series. I can't wait till the third book of this series. By the way, I love the cover. It is amazing and so pretty. Hey, I was asked to post this. 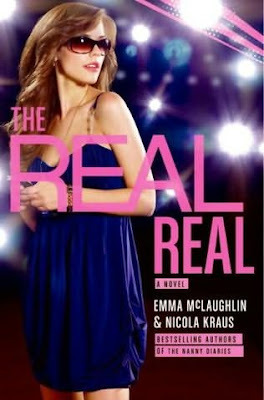 I reviewed The Real Real, last week, so check it out. From the authors of THE REAL REAL—Emma McLaughlin & Nicola Kraus—also known as the bestselling duo behind the Nanny Diaries. The tour kicks off this week, and they’ll be on Good Morning America tomorrow morning around 8:40 am to talk about their first YA novel. Penelope Leland has come to Ireland to study magic and prove to herself that she is as good a witch as her twin sister Persy. But when Niall Keating begins to pay her court, she can’t help being distracted from her studies. Especially when she learns that the handsome young nobleman is reputedly an illegitimate cousin of the new young Queen Victoria, her friend and idol, whom her sister saved from an ambitious wizard’s control spell the year before. 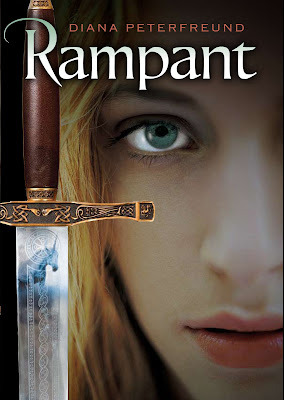 Niall Keating has strict orders from his sorceress mother Lady Keating: to make young Miss Leland fall in love with him so that she can be convinced to use her magical powers to help reconcile him to his true father, the Duke of Cumberland, Queen Victoria’s uncle. Niall is delighted to comply until he discovers his mother’s true aim: to assassinate Queen Victoria by magic and put Niall’s father on the throne of England. Penelope is thrilled when Lady Keating reveals her powers and offers to tutor her in magic. But Niall has fallen deeply in love with the lovely young woman. Even if he halts his mother’s evil plans, will Penelope be able to forgive him for trying to seduce her into a plot against her beloved queen? 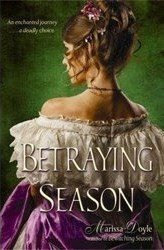 I really liked the first book(Bewitching Season). So I am excited to read this one. I am a huge fan of historical fiction. The cover is really pretty. Also, I love the cover. 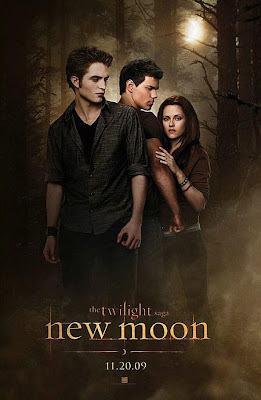 Here is the New Moon poster. Personally, it is really pretty in a spooky way. I like they showed the triangle that is forming. The mist in the forest is kind of not realistic. Forks is at a lower altitude then where I live in Washington and we rarely get fog. The sun peeking out is a nice effect. A few of the trees are not that healthy looking. So, they would have to be really deep in the forest. Bella(Kristin) looks kind of stoned in it, but I think that it could be a numb look. I do like the look of loathing between Edward(Rob) and Jacob(Taylor). I like Taylor's hair more in this movie. In Twilight, he looked like a girl. Overall, it is pretty great and pretty much what I wanted. Beth told me that she wants to get it already. So, it is reaching to the younger teen audience. So, what do you think of it? Do you love it or hate it? Cate Sloane: She dominates the ninth grade at exclusive Ashton Prep. Tantrum-prone and competitive, Cate would rather wear Laura Ashley every day than be second best at anything. Luckily there's not a rival in sight. Yet. Andie Sloane: Twelve-year-old Andie desperately wants to walk the runway. Her face is flawless, and boys flock to her like love-struck sheep. There's just one leetle problem: She's only 4' 11". But with a new supermodel stepmom, she'll be voguing in no time. Right? Stella Childs: With her take-charge attitude and a closet full of supermodel swag, Stella was the It Girl at her London middle school. She's determined to rule Ashton Prep—even if that means dethroning the current queen bee. Can you say British Invasion? Lola Childs: London boys called gawky Lola "Sticks," but she's got a new mission in Manhattan: boyfriend or bust! With the help of her boy-magnet stepsister, Lola sets her sights on supercute Kyle Lewis. Too bad Kyle's only got eyes for . . . Andie. I also reviewed it last Monday. It is really cute. To enter: Just answer this question, What do you think is the worst thing that someone could do to her sister? This contest will end on June 1st and Sorry, international readers... I currently can't afford to ship outside of the US and Canada. I am feeling a bit better. Not amazing, but I no longer feel like I am dying. Well today, I watched Harry Potter and The Goblet of Fire twice, just to prove that David Tennant was in it. hehe. I am still misspelling stuff and my head hurts, but it is a improvement. I am going to write some soon, since I have this idea screaming at me. If you have twitter, Korianne and I are holding a race. The winner gets a paperback from each person. The race it to 11,111. You must be four digits order in be a part of it. If you are interested, at reply to http://twitter.com/tweet_fest. Good Luck. PS, In My Mailbox will be up soon. Maybe tomorrow. I am sick, and this is a blog for today. This count as one since I can't see well. Laurel has never been a normal girl. She only eats fruits and vegetables and never feels cold. When she moves to a new town and starts attending public school instead of being home schooled by her hippie parents. She makes some friends and establishes a normal routine. Until one day, she wakes up with a giant wing-like-flower on her back. Her friend, David tests a piece of it and finds out that it is a plant, but why is it growing out of her. She soon finds out that she is a faerie and that she agreed to be put in a basket on her parent's doorstep. Also, that her job is to guard her parent's land. The land holds the gateway to the faerie's world Avalon, but the problem is that the land is about to sold to a buyer. Laurel must stop her parents from selling it, protect the faeries' secret and her parents, figure out her feeling for her friend, David and a faerie, Tamani, and she also has to find out who she really is. I didn't know all that Wings was about when I bought. It had a gorgeous cover and I have heard mostly good thing about. I also knew that it was about faeries, but I have to say that is it the most unique faerie book that I have read in a long time. Aprilynne Pike has an amazing debut novel. The characters seem so realistic. Her friend, Chelsea seemed so lively and honest. I may not like her in real life, but I have met people like her before. Laurel made some weird choices and missed somethings that were so obvious. I also felt it weird that she didn't tell her parents about the lump that made the wings, when she though she might have cancer. Also when she was close with her parents.David was awesome, but I did not understand him fully. Anyways, this is the first of four books and I can not wait for the next one. This was an amazing book with great character, writing, and plot, and I can't wait to read more from Aprilynne Pike. Quinn goes to Austin with her love of music and a internship with Amalgam Records. She is staying with her cousin, Penny and her cross dressing dog, Miss Tiara. When her internship was actually though out to be a joke and the real intern is Jade. The good thing is that she knows the perfect indie guy, Sebastian, but there is also Penny's neighbour, Russ that makes Quinn think. I loved the characters. Quinn was so funny. Russ was sweet. Jade was awesome. I loved the fact that Penny had a cross dressing dog. The story was as cute as the cover. I loved how there was a mention of Violet as "I once knew this girl that worked at my movie theater who went to New York to became a fashion model." (Pg 114-115). Melissa is an amazing writer and I really loved it. 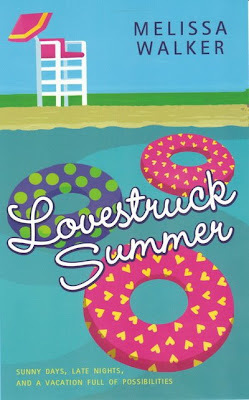 Lovestruck Summer is amazing and a great read. You should really check it out soon. Imagine that Laguna Beach, a Newport Harbor, and The Hills never happened. So, when your school and hometown is chosen for this show and so are you... This is reality for Jesse O'Rourke, who lives in the Hampton's and is far from rich. At first, she doesn't want to accept the check, but with the $40,000 check for college is more then desirable. So, Jesse does it. Her crush, Drew is in it and her best friend, Caitlyn is pissed that she is in it. As the show goes along, Jesse has to decide what is "real" and what is "Real Real"
It took me a long time to get into this book. There were a few thing that really bugged me in the middle. Jesse was okay. She did irritate me a few times. I liked Drew and how he wasn't as effected to by the show as much. I hated how she ditched her friends for the show and also hurt her parents feelings. It was fairly original plot wise. I did like the ending though. PS How do you like the new rating system? I'll keep why I want this short: Unicorns for the win! I am feeling really sick and have been in bed all day. So yeah. Now back to sleeping. I am sure that there will be more contest soon and definitely one around June 25th... I wonder why. Also when I hit 100 followers on Blogger there will be a prize given away. I am at 94 now, so that should happen in a month or two. If you are a google reader follower comment, so I can add you to the list. I just got a big bag of library books. So that is my cue to leave. Sloane Sisters was very cute. I have 3 sisters, so I know what it is like in the craziness aspect. 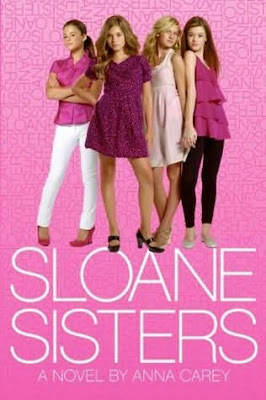 This is definitely a Gossip Girl like novel for a younger set and it was really done. It was really humorous, fun, and drama filled. The writing was well done. The charter were pretty well developed. I can't wait to read the rest of the series. I also love the cover. It is adorable. Candice has moved from New York City to Swoon, Connecticut and became Dice on the way. She now lives across the street from her cousin in a restored farmhouse. While her parents are still in the city, working. Dice is lucky to have a popular cousin, Pen, who is very sweet and innocent. Suddenly, Pen starts acting out after a tumble out of an old oak tree. Dice thinks that something is wrong and whatever it is it has taken over her cousin. Dice soon figures out that it is the ghost of Sinclair Youngblood Powers and he wants revenge on the people of Swoon. In concern of Pen, she preforms an exorcism and sets his spirit free somehow. Now, Sinclair is Sin and he is wreaking havoc all over town. Dice knows that she needs to stop him, but she might just really love him. 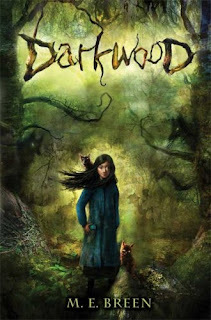 I found Swoon really interesting at the beginning and really liked, but as I got further in the characters really annoyed me. Dice was a strong character and I really liked her for the most part. Sin on the other hand was different. He really annoyed me and drove me crazy. Supposedly he loved Dice, but was doing all these things to hurt those that she was close too. Malkin did have a very strong vocabulary and her writing was really detailed. The history of the city of Swoon was well done and I liked that part. There was a lot of underage drinking, drug use, and a few sexual scenes, but this was most put as "teenagers just being teenagers". I really liked that Malkin didn't past judgement on them for doing this and I liked that. Swoon was a really unique novel. Nina Malkin is great writer and can't wait for more from her. 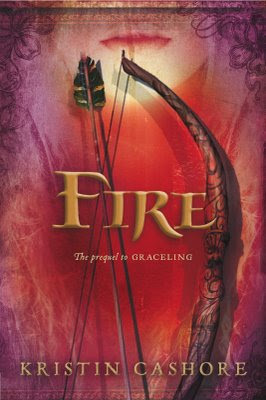 Graceling's prequel-ish companion book, takes place across the mountains to the east of the seven kingdoms, in a rocky, war-torn land called the Dells. 2. It has a gorgeous cover. Though I like the UK verison more. 4. There is a lot of Hype already. Mia is a happy person. She has a lovely family with quirky parents and a cut Mia has a great boyfriend, Adam. Mia also has a cello talent that could land her in Julliard. On a snow day, her family decides to go on a drive. Her life is changed in seconds. Mia watches her family and herself get loaded in to ambulances. 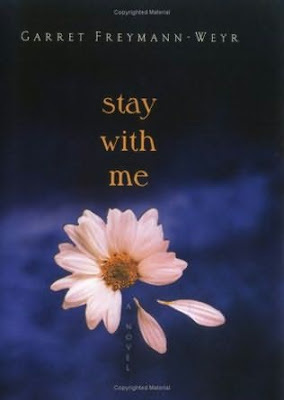 Her body is taken to the ICU and a nurse helps her understand that she has to choose on whether to stay with her boyfriend, future, and her non-immediate family or to go with her family. Mia decides from a series of flashbacks on what her choice of if she should choose to stay or to go. I found If I Stay to be more then imagined that it would be. I mostly picked it up, because of the cover and what other bloggers said. So, I had little clue on what it was about. The character were amazing. I love Mia and how she took time to figure out what she should do. I also loved Adam and how he never gave up. He was very sweet and awesome. 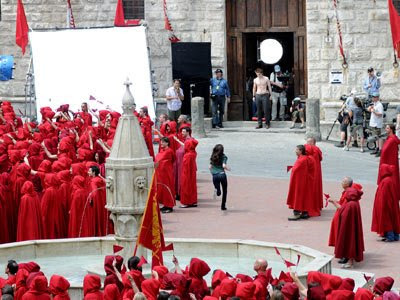 The setting was amazing. I have spent too much time in hospitals, so I know the standard layout. I also have been to Eugene, Oregon and it was well described. The approach of the plot was well done and original. I also loved the flashbacks of Mia's past. Forman is also a great writer and I can't wait to read more of her books. My friend, Amber of Must and Lust for Books! 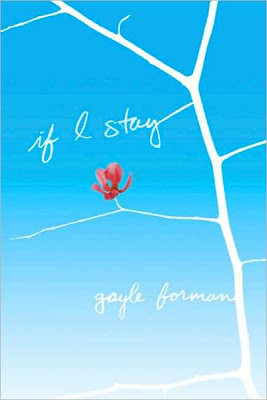 did her first review on If I Stay today, she also has a contest that ends Tommorrow at Noon EST. So go check her out, she is so awesome. Anna is going on a trip with her best friend, Frankie to Zanzibar Bay. 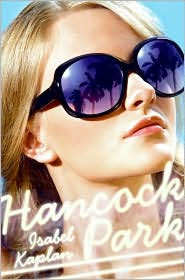 Frankie thinks that it will be the perfect time and place for a summer romance, a quick and harmless fling. During swimsuit shopping, Anna and Frankie come up with a plan for the Absolute Best Summer Ever. The plan is to see who can get the most guys in twenty days. The problem is that Anna, isn't over Frankie's Brother, Matt, who died suddenly in a car crash. So, Anna is holding on to that time with Matt and hiding the secret from Frankie. Twenty Boy Summer had an amazing setting. I felt like I was in California and feeling the sunshine, when I read it in March. Anna was true to herself. Her relationship with Matt appeared to be honest and sincere. There were a few things that I didn't like about Frankie in the beginning, but she seemed to grow up and be more honest. 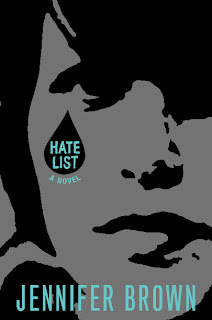 Oakler does and amazing job creating a well woven story that digs in to your heart. You will cry, laugh, and fall in love with the characters and the storyline. Oakler has an amazing debut of love lost and living every moment of your life to the best you can. I loved this book and could fangirl it for quite bit longer. Anyways, I recommend this book. 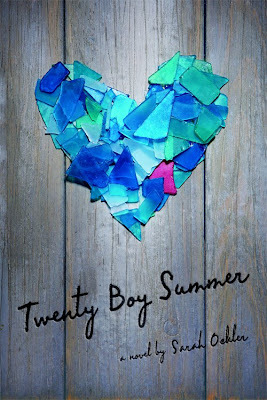 Twenty Boy Summer comes out on June 1st. I just finished this book and it was amazing. I love this cover and have been waiting to read about for a while. It’s been six months since Reggie first discovered and fought against the Vours, malicious and demonic beings that inhabit human bodies on the eve of the Winter Solstice. The Vours still haunt Reggie, but only in her dreams-until one night, when an unexpected visitor turns her nightmares into reality. I read this on Monday. It was scary and better then the first. Sorry about no cover. 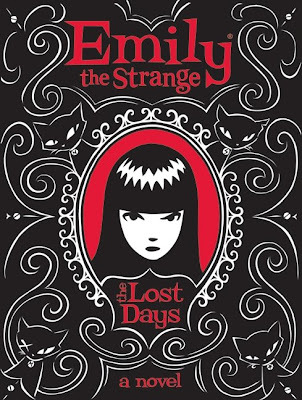 In her first adventure, Emily the Strange: The Lost Days, Emily arrives in the small, sinister town of Blackrock. Armed with only a blank notebook and a slingshot, she has no memory of how she got there, who she is, or even of her own name. The story that follows in Emily’s first-person narrative is part mystery, part adventure, and wholly, delightfully strange. I haven't ever owned any Emily the Strange Merchandise, so I didn't really know anything about this book. When I got it, I have already read it and found it pretty good. I was really excited to get this book. Khy is plotting on stealing it from me.I have read it and it is amazing. I wish I could find the Cover... it is pretty. She's looking good . . . but Allison Avery can't believe it. Growing up with beautiful, blond sisters, Allison has always been the dark-haired, "interesting-looking" Avery. 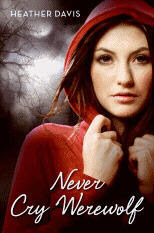 So when the devil shows up and offers to make her gorgeous, Allison jumps at the chance to finally get noticed. But there's one tiny catch, and it's not her soul: The devil wants her cell phone. Though her deal with the devil seems like a good idea at the time, Allison soon realizes that being gorgeous isn't as easy as it looks. Are her new friends and boyfriend for real, or do they just like her pretty face? Allison can't trust anyone anymore, and her possessed phone and her family's financial crisis aren't making things any easier. Plus, when she finds out that she might be America's next teen model, all hell breaks loose. Allison may be losing control, but how far is she willing to go to stay gorgeous forever? Following the critically acclaimed Lucky, Rachel Vail continues her poignant sisterhood trilogy with the rebellious middle Avery sister, Allison. 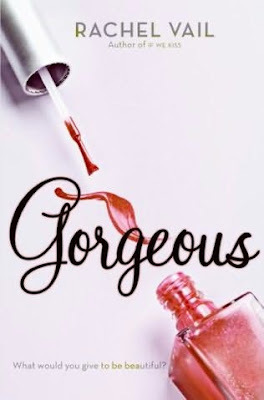 Fiery, sarcastic, and just plain fun, gorgeous captures the heartbreak and hilarity in one girl's attempt to have it all. I really liked Lucky, so I am excited to read this. Becky Miller lives in the best neighborhood, goes to school with the children of movie stars, and has her psychiatrist on speed dial. She may live in the City of Angels, but this sixteen-year-old's life is far from perfect. By day, Becky navigates the halls of one of L.A.'s most elite schools, where the mean girls are a special breed of mean, and at night, she deals with sparring parents, a grandmother who is man-crazy, and a younger brother, Jack, who answers only to J-zizzy. As Becky's life comes crashing down around her, she struggles to put it back together and learn to grow up while trying to stay sane. Isabel Kaplan dishes the dirt on the children of Hollywood's elite—from Spago delivered to campus at lunch and shrinks who dole out psychotropic drugs as though they're candy to parent-free parties at the Four Seasons—the lives of Becky and her creator, Isabel Kaplan, are like no other, and yet strangely, just like everyone's. This book sound really good. I love the cover. It is so pretty. This book sounds pretty good. I love the Cover. Okay, so maybe Shelby has made a few mistakes with boys lately (how was she supposed to know Wes had “borrowed” that Porsche?). But her step-mother totally overreacts when she catches Shelby in a post-curfew kiss with a hot senior. Suddenly Shelby’s summer plans are on the shelf, and she’s being packed off to brat camp. It’s good-bye, prom dress; hello, hiking boots.Things start looking up, though, when Shelby meets fellow camper (and son of a rock star) Austin Bridges, III. But soon she realizes there’s more to Austin than crush material—his family has a dark secret, and he wants Shelby’s help guarding it. Shelby knows that she really shouldn’t be getting tangled up with another bad boy…but who is she to turn her back on a guy in need, especially such a good looking one? One thing’s for sure, that pesky full moon is about to get her into trouble all over again. I love this cover. It is so pretty. This book is super cute. Sixteen-year-old Leila Abranel was born some twenty years after her sisters. Her elegant sisters from her father's first marriage have lives full of work, love affairs, and travel. Leila doesn't know either of them very well, but she loves hearing about them—details of Rebecca's ruined marriage, Clare's first job, and the strings of unsuitable boyfriends.When Rebecca kills herself, Leila wants to know why. She starts by spending time with Clare and finally comes to know her as a person instead of a story. With Clare's reluctant help, Leila tracks down Rebecca's favorite places and tries to find her sister's friends. Along the way, Leila meets Eamon. Eamon is thirty-one and writes for television. He thinks Leila is beautiful and smart, but he does not, he tells her, date teenagers. And yet, the months go by and Leila turns seventeen and learns that you can love someone you are not dating. Maybe letting Eamon love her back is a mistake. Maybe she'll never know why Rebecca did what she did. Maybe, Leila, decides, most people have a hard time figuring out which way is left or knowing when to let go and when to stay. This book sounds amazing. I love the cover. So, I was happy to get it off Bookmooch. Jill was nice enough to let me borrow this. It looks pretty good. 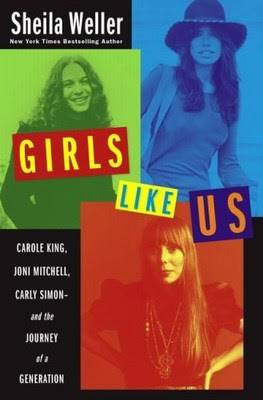 The epic story of three generational icons, this triple biography from author and Glamour senior editor Weller (Dancing at Ciro’s) examines the careers of singer-songwriters Carole King, Joni Mitchell and Carly Simon, whose success reflected, enervated and shaped the feminist movement that grew up with them. After short sketches of their early years, Weller begins in earnest with the 1960s, switching off among the women as their public lives begin. A time of extremes, the 60s found folk music and feminist cultures just beginning to define themselves, while the buttoned-down mainstream was still treating unwed pregnant women, in Mitchell’s terms, like you murdered somebody (thus the big, traditional wedding thrown for King, pregnant by songwriting partner Gerry Goffin, in 1959). Pioneering success in the music business led inevitably to similar roles in women’s movement, but Weller doesn’t overlook the content of their songs and the effect they have on a generation of women facing a lot more choice, but with no one to guide them. Taking readers in-depth through the late 80s, Weller brings the story up to date with a short but satisfying roundup. A must-read for any fan of these artists, this bio will prove an absorbing, eye-opening tour of rock (and American) history for anyone who’s appreciated a female musician in the past thirty years. B&w photos. This book caught my eye and it looks amazing. I love all three Singers. So, I got a lot this week and I am excited. Anyways, my friend Laura, at Laura's Review Bookshelf is having her 5th month a day late and has a contest going on. So go visit her, Here. Books read in April, or what I call a reading slump for the most part. Reviews posted from these books: 4 of these books, a few are planned to be posted later. My Favorite: The Body Finder... just wow. My Least Favorite: Tender Morsels, I had a hard time getting into it. 100+ Reading Challenge: 87 read. 13 to go.